Lion dance has been part of Chinese culture for thousands of years and is performed on auspicious events such as weddings, new store openings and various festivals and celebrations. The lion, a symbol or power, wisdom and good fortune, chases away evil spirits and brings happiness, longevity, and good luck. The lion dance is also performed at many business locations during Chinese New Year celebrations asr the lion brings prosperity and good luck to the business for the upcoming year. Performed in a lion costume, accompanied by the music of beating drums, clashing cymbals, and resounding gongs, the lion dance imitates a lion’s movements and demonstrates martial arts agility, depending on the style. In many countries in South East Asia such as Singapore, Malaysia, Brunei and Thailand the lion dance is performed during funerals as part of the custom to celebrate the life of the deceased, however the lion must be in the traditional funeral colour of just black and white. The Chung Wah Lion Dance Troupe has a relatively short history. 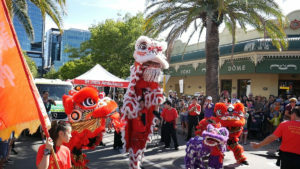 The troupe came together in Perth during the late 1960s by a group of overseas engineering students from Christmas Island with past Lion Dance experience. They got together and performed at restaurants, private functions, parties and cultural shows. They soon became known as the WA Lion Dance Troupe in the early 1970s. There are two distinct styles of Lion Dance, Fuk Shan and Hok Shan. The pioneers of this troupe created their own unique style of lion dance incorporating both the Fuk Shan and the Hok Shan styles to have the better of both styles. The troupe soon faced problems with lack of new members, but luckily during this time, the Chung Wah Association indicated its interest in including Lion Dance as one of its activities. It was due to this that the Chung Wah Association Lion Dance Troupe was formed in 1984. With the sponsorship and support of the Association new lion costumes and equipment was purchased and the troupe has been kept active with performances during the Chinese New Year celebrations. In October 1985, a children lion dance troupe was formed in conjunction with the Chung Wah Chinese School. This new young troupe made its debut at the Chung Wah 75th Anniversary Celebrations. In 1988, Simon Lee donated a great green dragon that resulted in the birth of the Chung Wah Lion and Dragon Dance troupe. Until then Chung Wah Lion Dance Troupe had solely been a Lion Dance troupe. We received our first lessons in performing the dragon by Simon Lee as he was a dragon dancer in his youth and had been a strong supporter of the troupe ever since. The difference between Chung Wah Association Lion and Dragon Dance Troupe and other troupes is that we do not have a Si Fu and we do not practice Kung Fu or Wushu. Everyone has an equal say in all and everyone can have a chance to learn Lion Dance regardless of whether they have a martial arts background. Our troupe greatest achievements are internationally recognised, being amongst the first of many troupes around the world to be able to fly three metres on props and do a 180 degree jump on the tightropes. In 1988, the Chung Wah Association Lion and Dragon Dance Troupe was invited to their first international competition in Malaysia, led by David Chew. The competition opened our eyes to what other lion dance troupe were training up for and the standards to be achieved. In 1994, we competed in Malaysia, Genting Highlands, and was ranked 7th in the world. In 1995 we competed in Hong Kong and was ranked 5th in the world and in 1996 in Malaysia we were seeded 5th out of the 28 competing teams. Currently we are still looking for fresh members to join us, so if you think you have the passion to learn and be part of the team, contact Aaron Loong on 0434 665 170 or email liontroupe@chungwah.org.au. There is no age limit and we encourage females to join as well. We have two training sessions, every Friday from 6.30pm until 9.00pm in Chung Wah Cultural Centre, Balcatta and every Sunday from 2.00pm until 5.00pm in Chung Wah Hall, 128 James Street, Northbridge.